Recently engaged (after 13 years!) my fiancé and I thought it would be fun to choose a wedding themed costume this year. 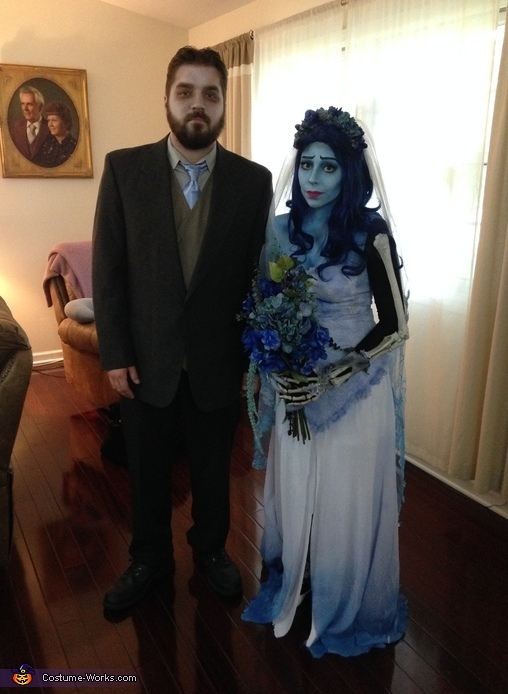 We decided to go forward with corpse bride, and although it was a lot of work it was very fun! My dress was a basic white dress that I I added sewn lace detail to and used several dyeing techniques to achieve the right color (including dip dyeing!). I added the exposed ribs while sewing on the lace, and roughed up the edges of the dress to complete the look. I did similar techniques to the veil and gloves. I made my skeleton arm by disassembling a skeleton and attaching the pieces to a black glove, this gave the illusion of a bony arm during the evening as the black disappeared into the night! I made the bouquet and veil out of craft store flowers and patience. Lastly, I combined two pairs of tights (blue and black) and painted the bones on the black side to create a skeleton leg effect. My fiancé's costume was mostly thrift store shopping to find the right pieces. The most involved part was my makeup - which involved painting my upper half and arm completely blue, adding contouring, covering my brows, etc. It took hours! We had an amazing halloween and it was a fun way to get excited for our wedding, we are thrilled with how it turned out and excited to share it with the world!